When it was announced that Marvel was going to be doing a reboot of the Spider-Man films a lot of people (myself included) thought: ‘too soon?’ It has, after all, only been 10 years since the first Sam Raimi Spider-Man film came out, and 5 years since the third one. But The Amazing Spider-Man director Marc Webb was confident that he could make an alternative film using the same character, in a different context. Webb does indeed make the franchise his own, as does Andrew Garfield as his new Spider-Man, both of them injecting fresh new ideas and feelings into the story everybody knows by now: geeky boy Peter Parker pines after girl (changed from Kirsten Dunst’s Mary Jane in the first franchise to Spidey’s other crush, Gwen Stacy, here played by Emma Stone), boy gets bitten by genetically mutated spider, boy starts to realise he has gained Spidey sense and sticky-web powers like the ability to walk up walls. The plot this film version centres around involves Dr. Curt Connors (Rhys Ifans) who previously worked with Peter’s father and is now experimenting with regenerating limbs. It also shows how Peter’s father and mother left him when he was a child to his Aunt (Sally Field) and Uncle (Martin Sheen) under mysterious circumstances. It is this new version of the plot that makes the film much more interesting, instead of simply recycling parts of the Raimi films which it could have done. For example, here Peter isn’t so much bullied as just in the wrong place at the wrong time. He’s not so much a nerd as someone who passes invisibly through the halls in his school, which he is ok with. 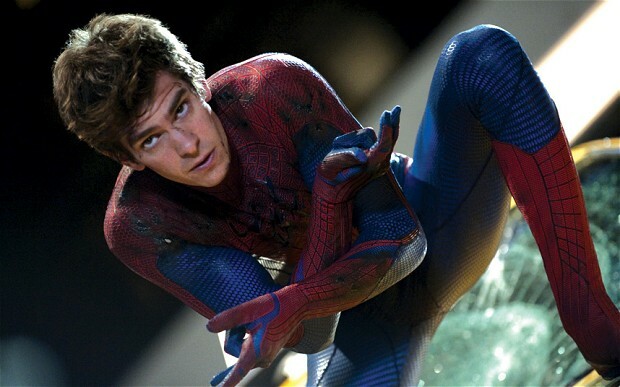 I was originally dubious about Andrew Garfield being cast as the new Spider-Man. My main bugbear was that he was just too cool looking and handsome to play the geeky outsider. But Garfield completely blew me away – in fact I’d even go so far as saying he’s much more suitable in the role than Tobey Maguire was. Once you see Garfield as Parker, you begin to realise just how much older Maguire was at the time. And like I said, this version isn’t so much about Peter being a dork, it’s just that he’s an outcast. And Garfield plays it well: his Peter is sweet and quick to help people, and pained from the loss of his parents. Emma Stone as Gwen Stacy is also excellent, but I am pretty sure I’ve never seen her in anything bad so far. Her and Garfield gel well together onscreen too (it’s not surprising that they’re now an item). However she does tend to fall into the category of helpless female who needs to be rescued by a superhero. Webb’s direction is confident and interesting. He feels like he’s now made the franchise his own. He makes the fight scenes fast and exciting, particularly when Parker uses his Spidey sense. He’s also added a huge dose of humour to the proceedings, mostly by showing Peter slowly getting to grips (literally) with his new powers. Where the film does begin to let the side down is during the climax. The pace starts to drag as we race towards another inevitable standoff between superhero and supervillain. And it’s a pretty unsatisfying fight at the finish line too. Everything starts to become far too convenient at the end also – I can’t say why without giving it away but it’s another case of a solution to a problem being suddenly revealed and handily found. And one other huge problem with the film? CGI Lizard. It could have been so much convincing with prosthetics as well as CGI. Instead you can’t help but notice how badly it’s been done, distracting you from the story at hand. The Amazing Spider-Man is still a huge achievement by Webb over the doubters (*ahem* including me). He creates a fresh new version of the everyone’s favourite friendly neighbourhood Spider-Man that is entertaining and funny, and Garfield makes the character his own in an entirely different way. It’s already been greenlit for sequels, but this time I’m excited to see where they’re going to take this new Spidey next. ~ by square-eyed-geek on August 16, 2012. This entry was posted on August 16, 2012 at 12:16 am and is filed under Film, Reviews.You can follow any responses to this entry through the RSS 2.0 feed.You can leave a response, or trackback from your own site.